which one would an individual have the most potential to realize capital gains with the least amount of stress or risk? Which one is easier to learn the ropes and gain experience? All the online documents I've see online seem to suggest that it would be a matter of preference to some extent. Forex vs Day Trading: These can be one and the same, as most people who trade forex do it as day trading. Forex is the instrument you are trading and day trading is the time frame you are doing it in. If your meaning from your question was comparing trading forex vs stocks, then it depends on a number of things. Forex is more liquid so most professional traders prefer it as it can be easier to get in and out without being gapped. However, if you are not trading large amounts of money and you stay away from more volatile stocks, this should not matter too much. It may also depend on what you understand more and prefer to trade. You need to be comfortable with what you are trading. If on the other hand you are referring to day trading vs longer term trading and/or investing, then this can depend largely on the instrument you are trading and the time frame you are more comfortable with. Forex is used more for shorter term trading, from day trading to having a position open for a couple of days. Stocks on the other hand can be day traded to traded over days, weeks, months or years. It is much more common to have positions open for longer periods with stocks. Other instruments like commodities, can also be traded over different time frames. The shorter the time frame you trade the higher risk involved as you have to make quick decisions and be happy with making a lot of smaller gains with the potential to make a large loss if things go wrong. It is best once again to chose a time frame you are comfortable with. I tend to trade Australian stocks as I know them well and am comfortable with them. I usually trade in the medium to long term, however I let the market decide how long I am in a position and when I get out of it. I try to follow the trend and stay in a position as long as the trend continues. I put automatic stop losses on all my positions, so if the market turns against me I am automatically taken out. I can be in a position for as little as a day (can happen if I buy one day and the next day the stock falls by 15% or more) to over a year (as long as the trend continues). By doing this I avoid the daily market noise and let my profits run and keep my losses small. No matter what instrument you end up trading and the time frame you choose to trade in, you should always have a tested trading plan and a risk management strategy in place. These are the areas you should first gain knowledge in to further your pursuits in trading. This image is an advertisement from a recent Barron's. The broker would want to put himself in the best light, correct? 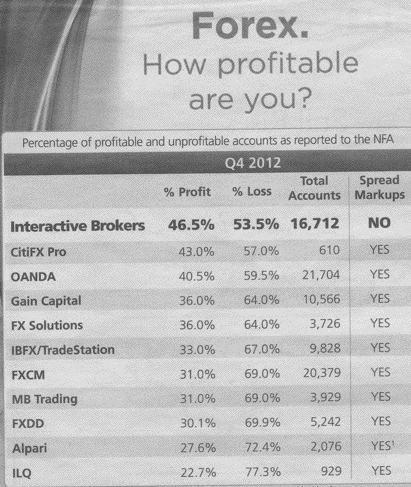 This shows you that of their current accounts, 53.5% are not profitable. And, keep in mind, these guys have the best track record of the list. Also, their client base isn't random. The winners tend to stay, so even if it were 50/50, the 50% of losers might represent many times that number of people who came to the table, lost their money and left. Are you in the US? Because if so, there are tax discrepancies. Gains from sale of stocks held for less than one year are subject to ordinary income tax, so probably around 30%. If you hold those stocks for a year or more, gains will be taxed as capital gains tax, 15%. For Forex, taxes on your earnings will be split 60/40. 60% will be traded at the lower 15% rate, while the remaining 40& will be taxed at a higher rate, approximately 30%. So purely short-term, there is a tax advantage to dabbling in Forex. HOWEVER - these are both incredibly risky things to do with your money! I never would recommend anyone invest short-term looking to make quick cash! In fact, the tax code DISCOURAGES people from short-term investments. Not the answer you're looking for? Browse other questions tagged foreign-exchange capital-gain comparison day-trading risk-management or ask your own question. Layman's guide to getting started with Forex (foreign exchange trading)? What college degree should I pursue to learn about stock and forex markets? Gains/loss calculation for staggered buys & sells? How to start day-trading? Any advice about software for beginner? Stock / forex trading 100s of transactions per day - how is the margin calculated?